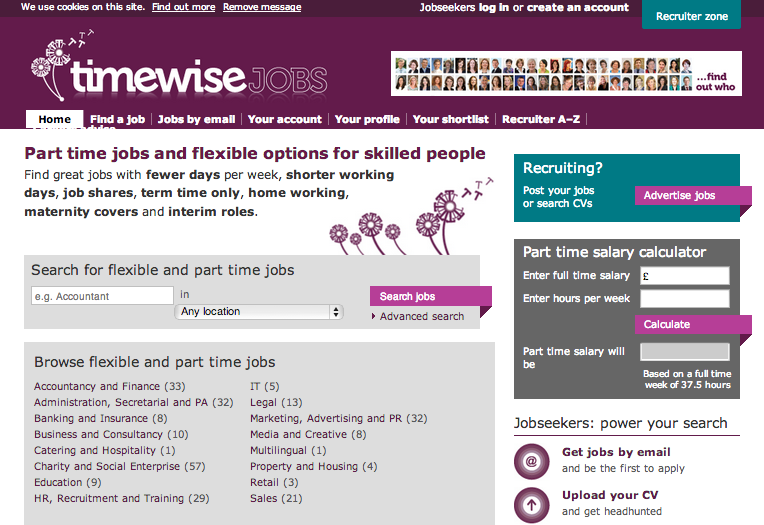 Timewisejobs is the ideal job site for finding flexible working options and part-time jobs in London and the UK. Most of the vacancies advertised on Timewisejobs are part time jobs, or involve working from home and are open to flexibility, for people with skills and experience. It covers a wide range of job sectors from Accountancy and Finance to Administration, Secretarial and PA. Job seekers publish their CV and get recruited. TimewiseJobs is a nice and easy to use UK job board specialising in flexible jobs and part time jobs in London and the UK. Go back to miscellaneous job category to find more job sites offering various job opportunities.